"Are you lonely Mummy?" Scout slips her little hand into mine and looks up at me with concern. I have been encouraging my children to interact with other children here in France. We go to the playground most afternoons, around about the time that the French children come out of school. Ralph and Scout are signing up for karate and ballet respectively and, with some help from the maire (the mayor), they have both been given special dispensation to attend Ecole Maternelle, despite the short time we are here and the fact that Scout is the wrong age. At first, they pushed back. They are such good friends, my little ones, and almost entirely self-sufficient. They didn't feel the need to fight their shyness or traverse the language barrier to make new friends. But I persisted, and like the brave little champions they are, they have acquiesced. But all my talk about making friends and not being lonely took root, and now they are worried about me. "What will you do?" they want to know. "How will you make friends?" Apparently, we (and by "we" I mean "the Western world") are in the midst of what is being called a loneliness epidemic. Digital technology has made communication easier and faster than ever before, but it turns out that when it comes to psychology and mental health, communication is not the same as connection. In a recent survey of more than 20,000 American adults, close to half reported feeling alone, left out, and isolated. One in four Americans said they rarely felt understood. Scientists and psychologists are now saying that social isolation and loneliness will reach "epidemic proportions" by 2030, and that this will create a public health crisis. The latest research, based on more than 70 studies covering close to 4 million people from across North America, Europe, and Australia, has found that loneliness and social isolation significantly increase the risk of premature death. It all drills down to this: feeling connected to others is a fundamental human need. On the other hand, while connection and communication are not the same thing, neither are connection and proximity the same. Many of those people in the previous studies who said they were lonely were living with a partner. This backs up something that I firmly believe: the key to combating loneliness is not about how many relationships you have (or how many Facebook friends, YouTube followers or Instagram followers you have), but about how meaningful your relationships are. That's why I feel OK, and how I attempt to ease the fears of my children on my behalf. I have moved states and countries enough times that my friends are scattered all over the world. I have learned how to remain connected despite being geographically separated. That's not to say I don't genuinely love a coffee catch-up with my dear friends, or to share a meal with my husband at the end of a long day, but I do know how to feel connected when we are apart. The sting of loneliness can be felt by just about anyone, at any age and in any circumstance. However, social isolation and disorienting experiences can definitely create or exacerbate feelings of loneliness. So people in nursing homes, hospitals and prisons, for example, as well as migrants, people who are unwell at home, and the live-in carers of people who are unwell at home, are more likely to become quite lonely. This is a beautifully and sensitively-written article that talks more about modern loneliness. So I was thinking. What if we were to all reach out to people who were either lonely, or at risk of feeling the kind of social isolation that leads to loneliness? Could you help? International Letter Writing Week is coming up next month (it's the week that coincides with the official UN World Post Day, on 9 October). What if we were all to commit to writing a letter or a postcard a day to someone who is lonely, throughout that week, to help them feel more connected? 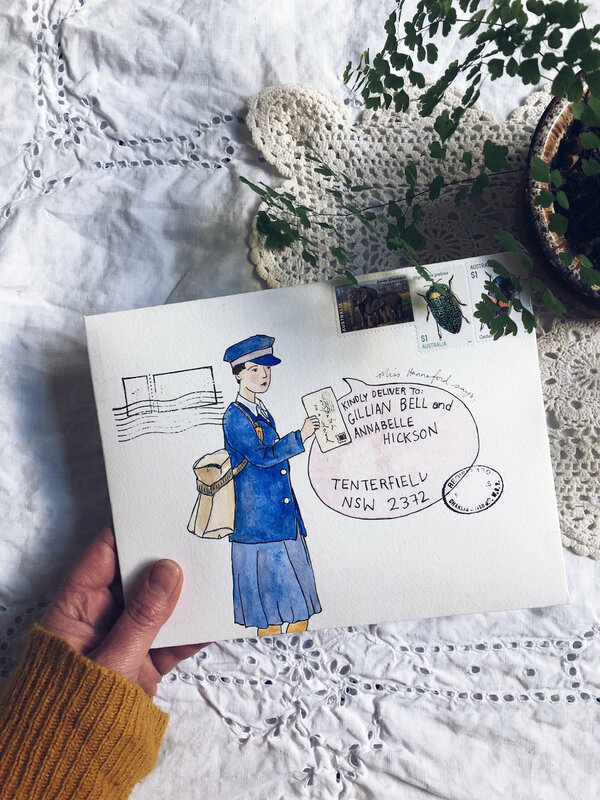 A letter is a lovely way to share your emotions, and invite others into parcels of your days, that is second only to catching up face-to-face. Even the tangible nature of your letters - your handwriting, the stationery you chose, any gifts or embellishments you made - make them personal. For someone who is experiencing loneliness or isolation, your letter is like a hug, and the time you give to properly reading a letter from them is a listening ear, or possibly even the shoulder they need to cry on. Of course, the act of writing to someone, when you write from the heart, does you bucket-loads of good as well. Sometimes I feel quite selfish when I'm writing my letters, because writing and making them makes me feel so good. Probably, it helps me stave off the loneliness I might otherwise be feeling, too. In the article I linked to above, loneliness is described as "a let-out-of-breath topic." So many people feel this kind of social malaise, and it's so nice that we can all be allowed to talk about it at last, and not feel any stigma. Maybe if we all get writing, we can turn the tide of isolation, and start to forge real connections again. ps. If you're in the mood for even more letter-writing inspiration, I want to remind you about my letter-writing and mail-art e-course, "The Most Beautiful Letter You Have Ever Written," from which this challenge-theme and the list in it was taken. 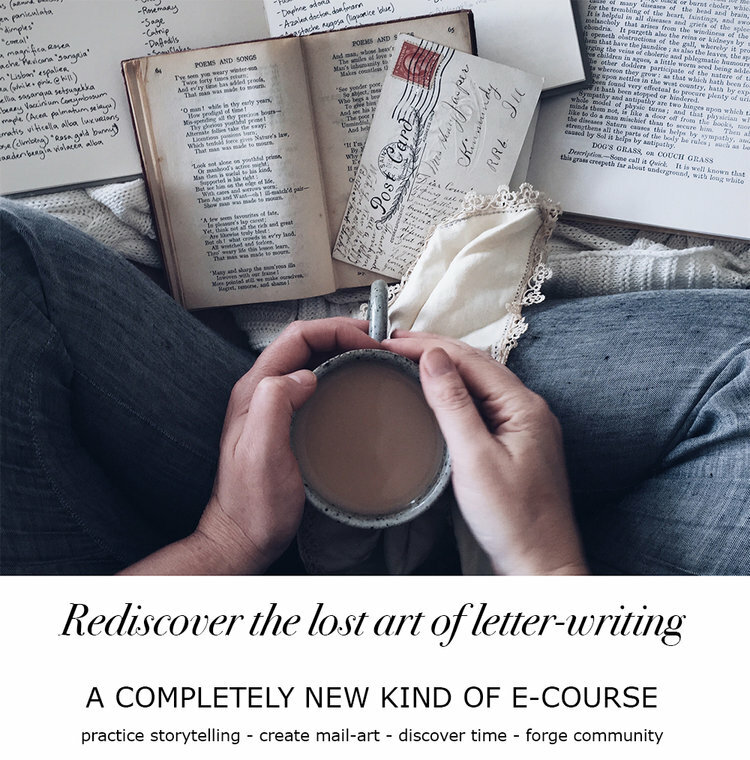 Over four weeks, I will guide you through multiple methods of making beautiful mail-art and creative, handmade stationery; teach you the art of writing and storytelling; help you forge personal connections in your letters and find pen-pals if you want them; and share time-management tips so even the busiest people can enjoy sending and receiving letters. There's also a host of downloadable resources, and access to my own private mail-art pen-pal group. Registrations are open right now, and you can find out more here.